Looking for an energy-packed and nutritious meal? 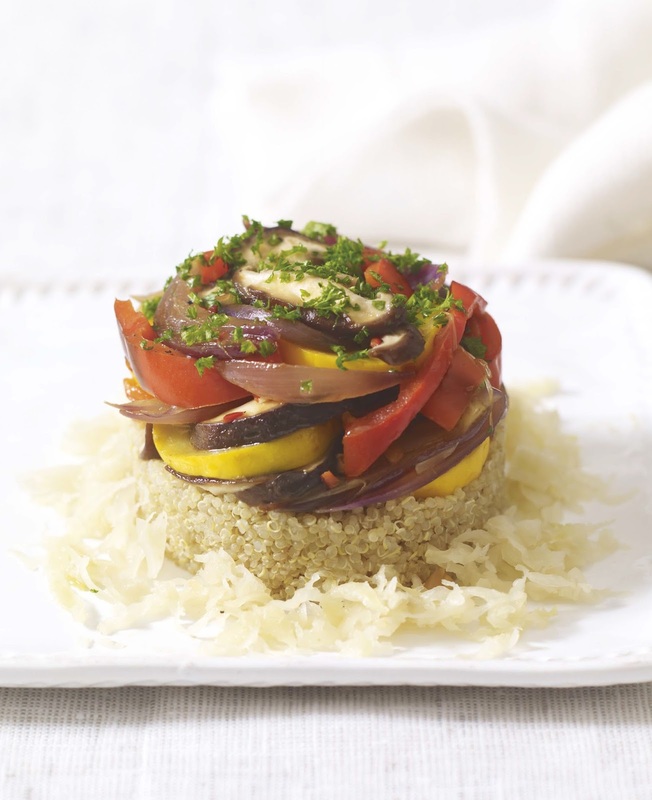 Try out this Quinoa and Vegetable Stack recipe from our Healing Foods Cookbook! High in protein and fiber, quinoa contains all the essential amino acids the body needs to sustain energy levels and support healthy tissue growth and repair. It is also gluten-free which makes it a good choice for anyone with gluten sensitivity. Sauerkraut brings multiple benefits for immunity and gut health and a selection of colorful fresh vegetables add valuable nutrients! Pour in enough water to cover the base of a medium saucepan and heat gently. Add the shallots and cook gently with the lid on until tender, adding more water if necessary. Add the chili and sauté gently. Add the peppers and allow to soften, then add the zucchinis. Lastly, add the shiitake mushrooms and garlic, season to taste with a pinch of sea salt, stir for a minute, and drizzle in the olive oil. Stir the mixture, place the lid back on, then switch off the heat and leave the pan on the stove to keep warm. When you are ready to serve the food, take a serving dish, place a large cook’s ring on it, and fill with a 1-inch layer of the quinoa. 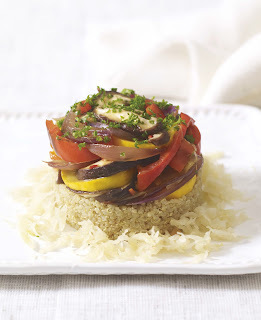 Spoon a layer of vegetables on top of the quinoa and sprinkle with some chopped parsley. Remove the ring and repeat with 3 more stacks. Sprinkle the stacks with black pepper and a drizzle of extra virgin olive oil, and serve with some sauerkraut arranged around the base of the stacks. If you don’t have a cook’s ring, use a dome-shaped small bowl brushed with olive oil. Fill the bottom half of the bowl with the vegetables, top with quinoa, place the serving dish face down on the bowl, turn both upside down, and gently remove the bowl. Sprinkle the parsley over the top, season, drizzle with the extra virgin olive oil, and serve with the sauerkraut. I love the presentation! My friends and family will love this dish! I'll have to make this soon! Thank you for sharing this healthy and delectable Quinoa and Vegetable Stack recipe with us at the Healthy Happy Green and Natural Party Blog Hop! I'm pinning and sharing. I can't wait to see what you share with us next!